Crater Lake is the deepest lake in the United States, and its water is the darkest azure blue I have ever seen anywhere. It’s worth the trip to this National Park in south central Oregon just to see this shade of blue, but timing is everything. Crater Lake National Park averages over 500 inches of snow per year, and spends eight months out of twelve snowed in. The backstory behind the lake is as dramatic as the color. Thousands of years ago, a huge volcano blew off its stack in a massive eruption forty times the size of the St. Helens blast. When the molten lava settled and cooled, it formed a perfectly sealed caldera that slowly filled with rain and snow, the only water source at this high altitude. Crater Lake’s water is some of the purest on the planet. 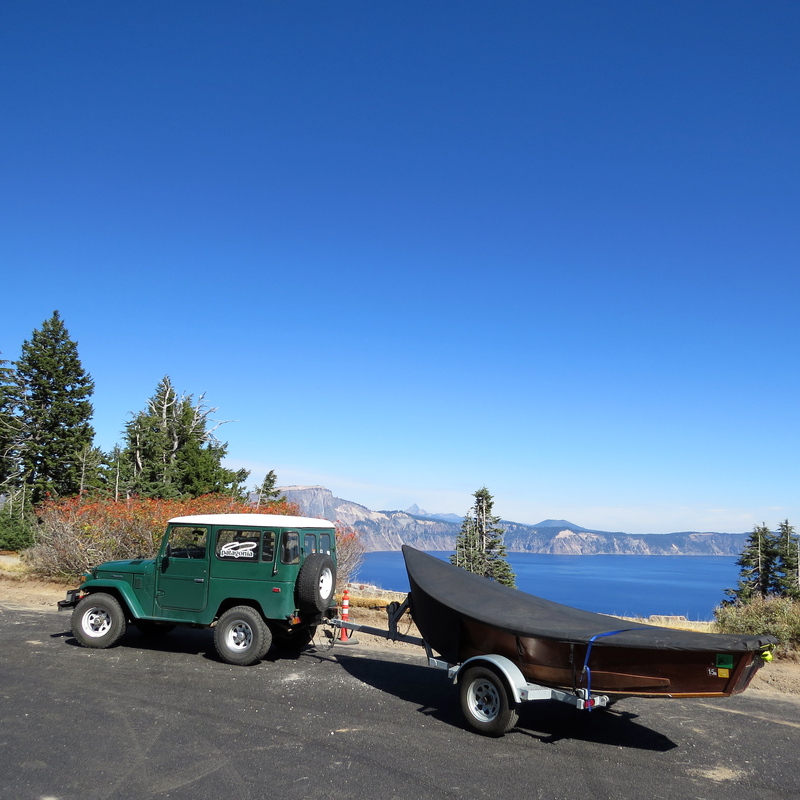 I arrived at the Ranger Station on the North side of the park and was immediately told that putting my little wooden boat in the waters of Crater Lake was strictly prohibited. There is no recreational boating allowed in this clean blue lake. No worries, I had other plans for the boat. I spent a cold night camping at 6,000 feet. When morning came, I packed up the Cruiser and prepared for a river adventure that would be one of the biggest rowing challenges of my life. The Rogue River gets it’s start in Crater Lake National Park. It explodes out of Boundary Spring, then sprints down the valley in a race with the Umpqua River to reach the Pacific Ocean. 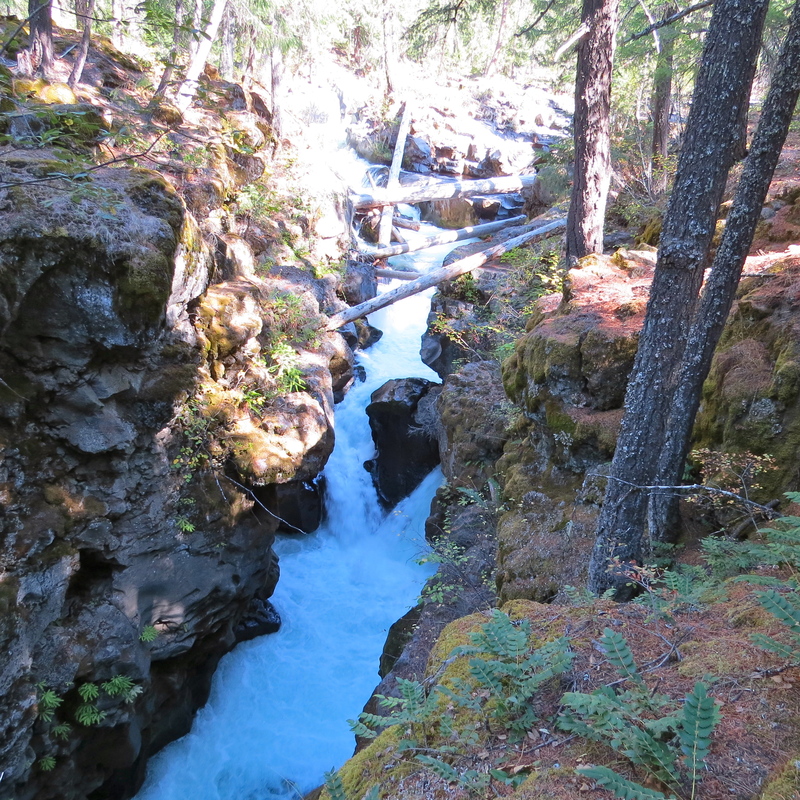 I hiked the trail up the river toward the headwaters where it’s so narrow you can jump from one side to the other. Even at this early stage in it’s life cycle, the Rogue shows signs of the rough & tumble personality that makes it famous. Cold water rushes around big boulders, tumbles over waterfalls, churns between canyon walls causing white water chaos that’s loud and breath-taking and exhilarating particularly if you have plans to put a boat on it somewhere downriver. 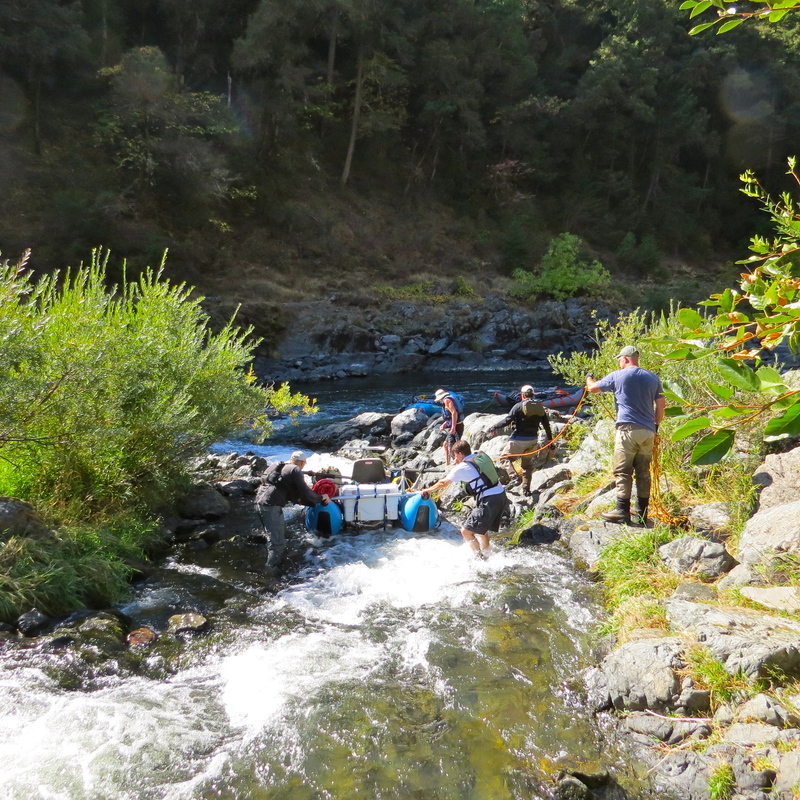 The Rogue was one of the original eight rivers to be designated “Wild & Scenic” in 1968 and is one of the most treacherous rivers in the Pacific Northwest. 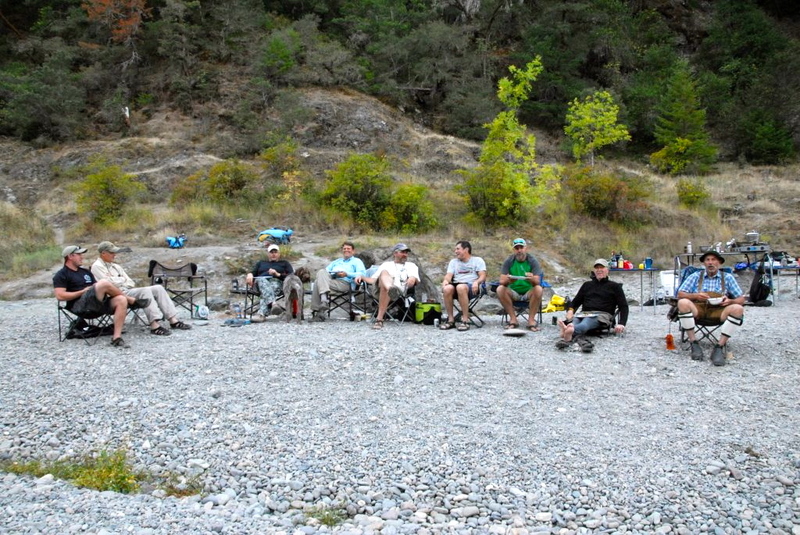 It’s where you’ll find me and my trusted river companions every Fall, running technical rapids, fly fishing, cooking and camping in a “leave no trace” section that is 4 days and nights of the most intense kind of river experience possible in the west. Like every other river in the west, the Rogue has been affected by the drought. Low water put it on the verge of ‘un-runnable’ for our trip, planned to launch on October 4th. “At some level – it just becomes too rocky and dangerous” said our trip leader Scott Vollstedt. We watched the river charts and hoped that the level would magically rise from ‘uncomfortably low’ to ‘comfortably passable.’ We needed rain and there was none in the forecast. Hoping for relief, we talked to the BLM to see if they had plans for any kind of water release from the reservoir above the dam, but there was nothing on the books. I talked to Debbie Thomason, the ‘Rogue River Queen’ who has owned the Galice Lodge for over thirty years. The Lodge serves as the launch pad and nerve center for most of the traffic on the wild and scenic section of the Rogue. The river was lower than she’d ever seen it. She’d stopped renting rafting equipment for the year because it was getting ‘torn up’ by the harsh conditions. …but not for long. It took the current less than a day to twist the frame and break the back of the metal boat, sending it to the bottom of the river. I couldn’t help but wonder what it would do to my little wooden boat in that spot if I made the slightest mistake. That was the bad news. The good news? The passage was clear. At Graves ‘put-in’ (just down from Galice Lodge) we readied our craft, loaded our gear and joked nervously about the low river conditions and the high degree of difficulty. From the very first rapid we knew the river was sharper. Rocks we’d never seen before were everywhere. The river notes we all had in our playbooks and our heads were virtually useless at this level that none of us had ever experienced. 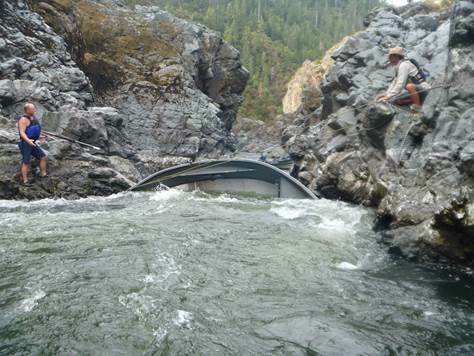 Lining our boats around the impassable Class VI Rainie Falls was problematic in the channel called “Fish Ladder”. With great difficulty we pushed, pulled, rocked and lowered our boats through the narrow, shallow, rocky chute one at a time. I held on tight to the 100′ rope and guided my unmanned wooden boat through the series of sharp drops. It ran the gauntlet unscathed until the last narrow passage where a jagged rock dug a 3′ groove in the side. No worries – mostly just a surface wound. 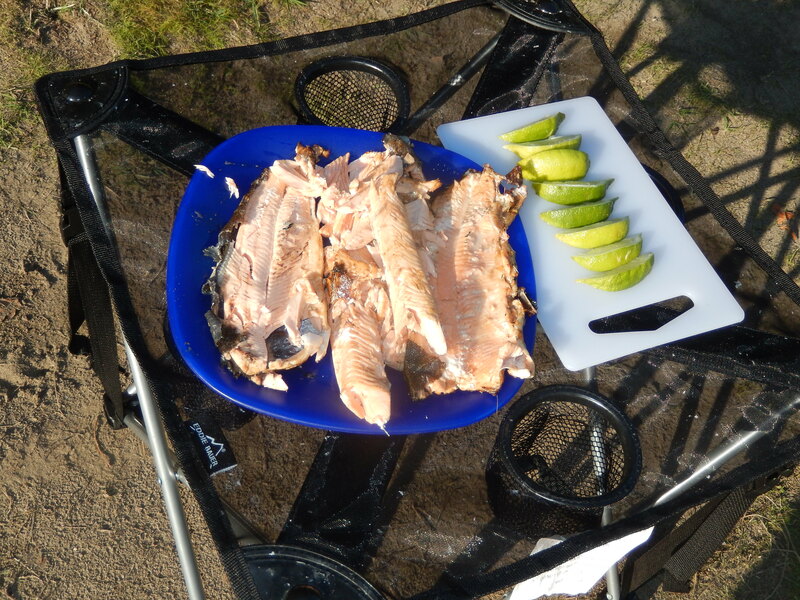 A few miles downriver, after the technical Class IV rapid called Tyee, we pulled into one of our favorite campsites on river right to rest our arms and our heads… and to cook up some amazing river food. 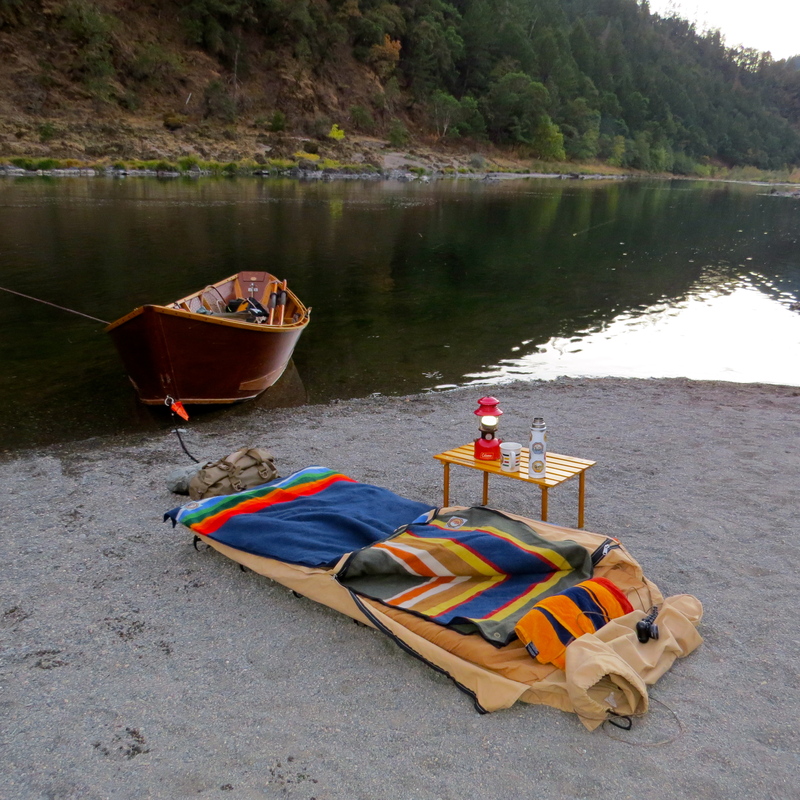 The weather was warm enough that none of us set up a tent – preferring the open air, a bedroll and a Pendleton blanket under the stars. From our campsite, we could hear the class III Wildcat Rapid roaring below us. I thought about the dangers of Alligator Rock in the middle of the rapid several times before falling asleep beside my boat. The next morning we ran Wildcat without incident. The rest of the day was filled with one technical rapid after another, most of them running more difficult than their rating because of the low water. Slim Pickins, a formation downriver only a couple of miles, caused problems for the group in front of us, stranding one raft on the rocks and flipping another upside down ejecting passengers and gear into the fast moving water. Based on the results of the runs before us on the left side of the Big Rock, everyone in our group chose the alternative route to the right which has an opening only a little wider than our boats. Imagine trying to thread a needle while riding a horse – that’s the right chute at Slim Pickins. Despite the high degree of difficulty, everyone in our group flew through the narrow opening on the right at Slim Pickins. 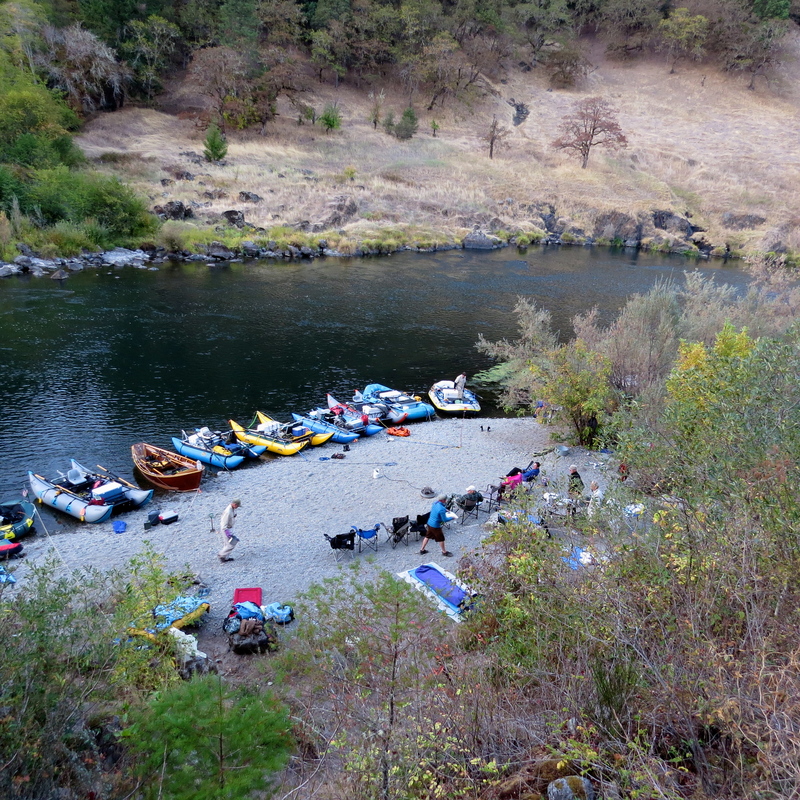 Another great spot to camp on the Rogue is “Battle Bar” – named for a brutal fight between the US Cavalry on one side of the river and the Takelma/Rogue Indians on the other in 1856. The fishing is usually good in this spot and the view is spectacular. We camp on the Rogue side of the river. 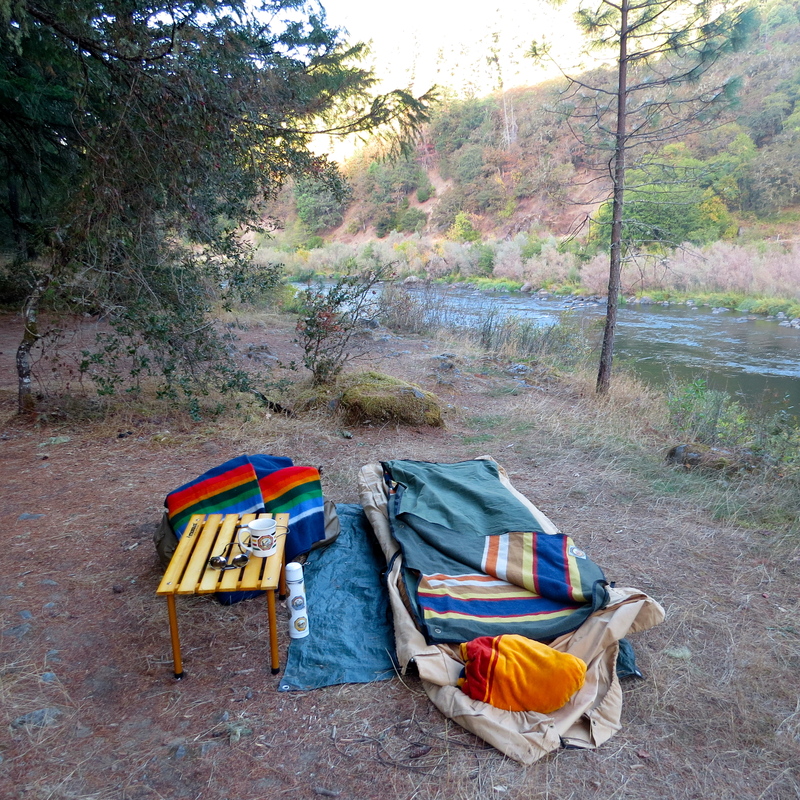 I set up my Therm-a-rest cot on the bluff overlooking our camp. 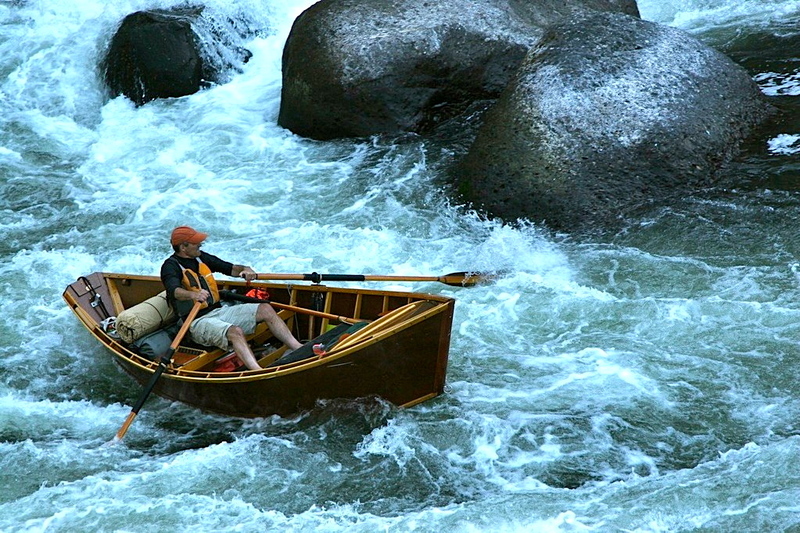 With most other difficult rapids on the Rogue, I rehearse the moves in my head a hundred times the night before we run them. Not Mule Creek. 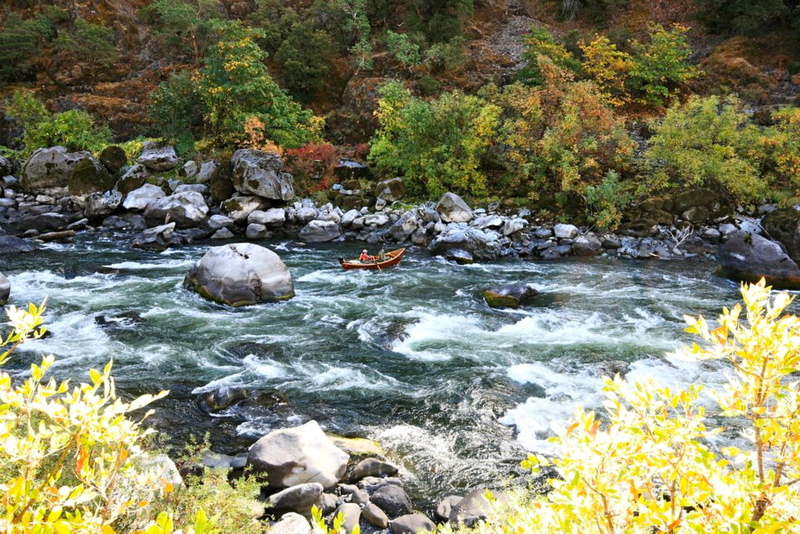 Of all the rapids on the Rogue, Mule Creek Canyon is the one I worry about the most. When it’s run right, it’s a fluid, improvised river dance in tight quarters requiring quick moves and steady nerves. The ‘line’ is constantly shifting, the walls of the canyon are steep and slick (a bad thing if you get separated from your boat), the water moves fast, and the eddies are powerful and pulsating. The passage is narrow, only 12 to 14 feet in some points. 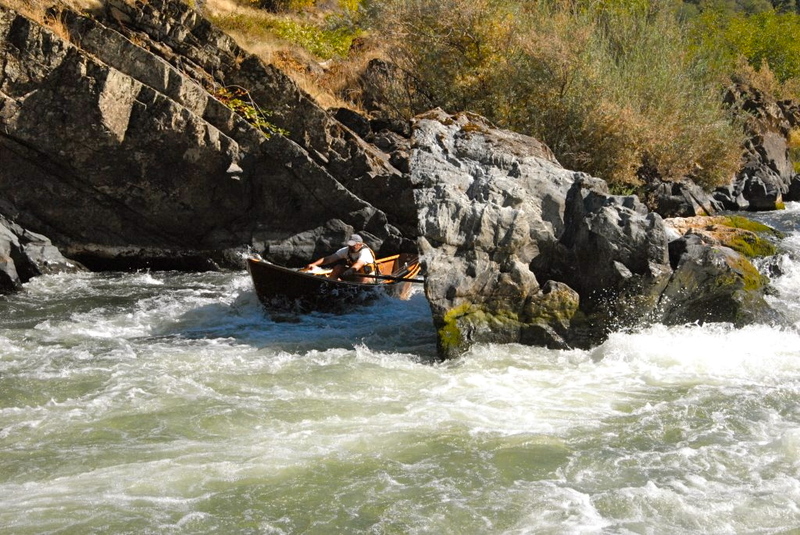 For much of the ride you can touch opposite walls by fully extending both oars (only total 18′ tip-to-tip). As the river drops, the canyon narrows and the slot gets even tighter. It feels like a bobsled chute. I fell asleep thinking about the narrow spot where the metal drift boat sunk just a few days before. When I woke, the important clatter of pots and pans meant coffee was ready, breakfast was “on” and it was time to get up. I stretched tired muscles and enjoyed the view of our colorful fleet of boats and the bustle of early morning preparations as everyone started getting ready to move out. I was ready to get going, even though Mule Creek Canyon was on the agenda for this day. I’m writing this, so you know I made it. Here’s a one minute clip of my run through Mule Creek. 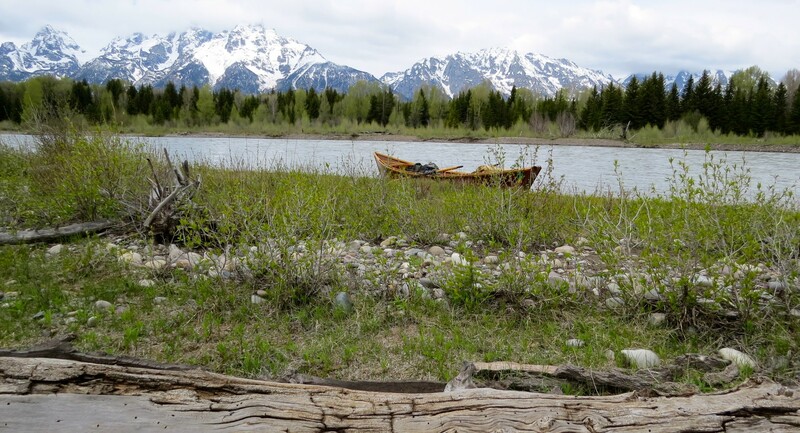 The sickening sound of wood-on-wall is actually my Sawyer oar keeping my boat off the rocks. Immediately following Mule Creek is the more well-known Class IV called Blossom Bar. 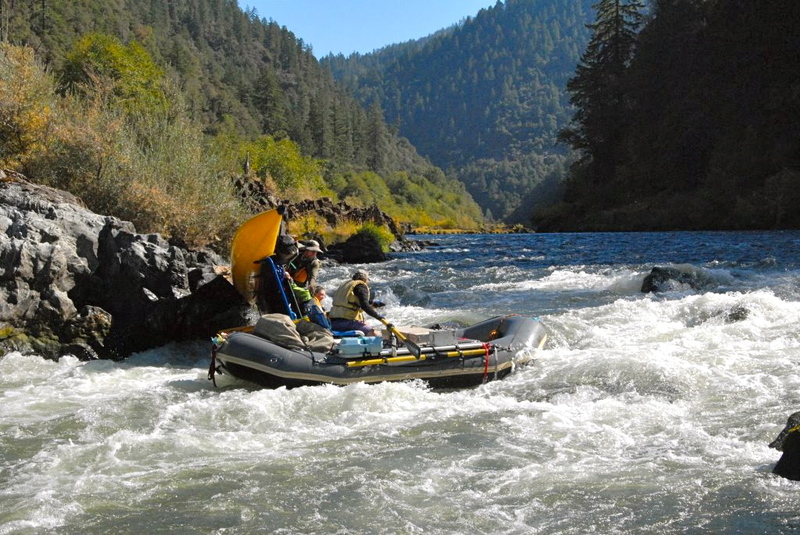 More river incidents occur in Blossom Bar than most any other rapid in the Pacific Northwest, many with life-changing consequences. As an oarsman, if you make a mistake in this rapid you will pay a price: a damaged boat, lost equipment, personal injury or worse. It’s reputation is well-deserved. At this low water level much of it is ‘blind’ – meaning the boulders and rocks are so exposed that they literally block your view of what’s around the next sharp corner. Many years ago I ran this rapid for the first time and I felt physically sick to my stomach on the scout overlooking the rapid and my legs were so weak I took a knee. It has turned into one of my favorites, mostly because the wood boat I row is so nimble and responsive. It was built to run rapids like this. And while I know the choreography of this rapid by heart, I still have butterflies every time I run it. There were a few ‘low water surprises’, but our entire group did great in Blossom Bar. The stress of river running does not end after Mule Creek & Blossom – not at this level. Low water conditions had us at the top of our game all the way to the take-out. All told, we grounded a boat or two, got some scrapes, broke one oar and lost another one along with some fishing gear, but everyone made it to Foster Bar in one piece. All boats floating – nobody hurt! That’s important to me, as my Rogue running mates are a fantastic crew and close friends. One night around the fire we tried to figure out exactly how it was that we all came together to be this group. It was an interesting series of connect-the-dots. 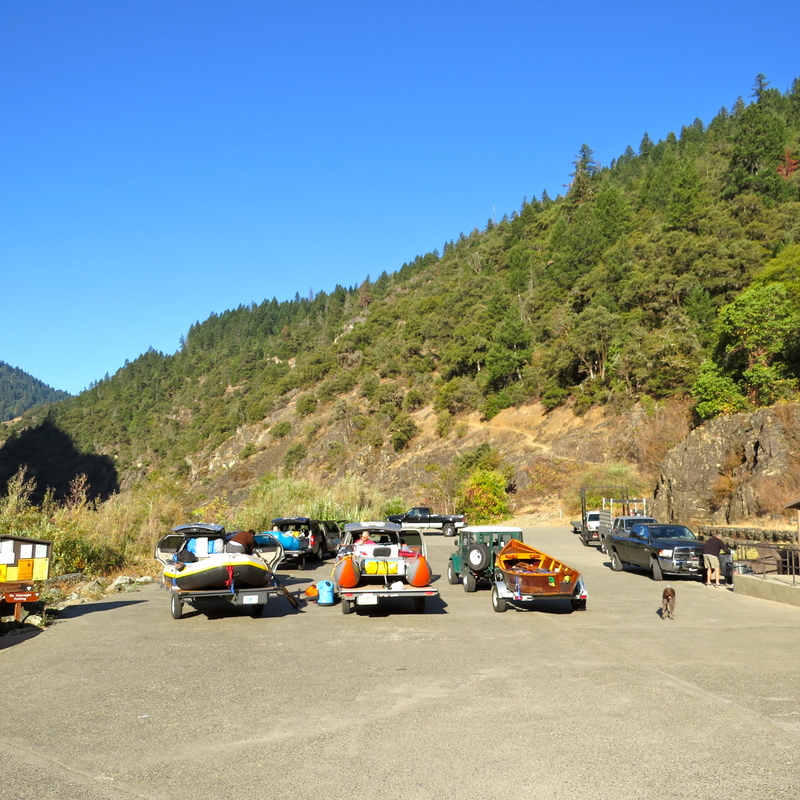 One thing is certain, the Rogue River brought us together and keeps us together. I’ve never been with better oarsmen or better people than these guys. Last night on the river. I don’t know if we will ever see the Rogue this low again, but if it’s early October, I know I’ll be with this crew running this river regardless of the level. I can’t wait. I urge you to experience the wildness of the Rogue for yourself. You won’t be disappointed. 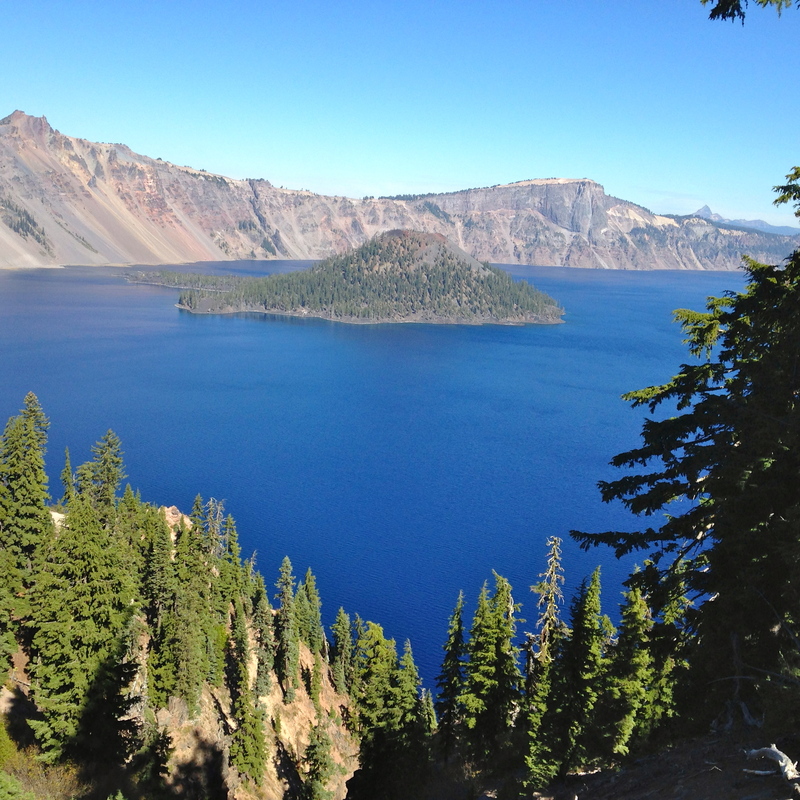 When you have a chance, visit Crater Lake National Park. You have to see that amazing blue at least once in your life. Photo contributions by Scott Vollstedt – “thanks Scotty”. Great pictures. Great narrative. It feels like I was there. Awesome story. Well told. I wanna go!! !